Post-it® Marrakesh Collection Notes in 76 x 76mm size hold stronger and longer, yet remove cleanly from surfaces. The plant based material used to make the adhesive is from a non-food plant that grows annually. Using plant material in the adhesive reduces our use of petroleum. 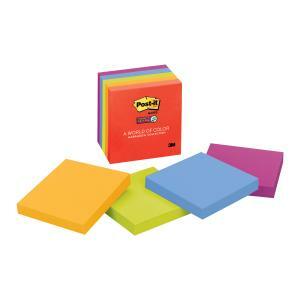 You can recycle these Post-it® Super Sticky Notes so they'll be turned into something new.